Here’s the thing: I wish my parents had done a baby journal for me. Here’s the other thing: as the mother of one toddler, finding the time to create one so my daughter doesn’t feel the same way is, to put it mildly, a challenge. Of course, if you were into scrapbooking or doing journal type stuff before you became a mom, it might be natural and a pleasure to do. I wasn’t and it isn’t. But I’m doing a journal for Astrid come hell or high water #$(*$!! Most expectant moms would like to think they’ll do one too. So why not make it easy for them to meet that goal by giving them one that hits all the highlights and milestones but doesn’t require them to write a novel every month of the baby’s first year of life? The Wonder of You is the one I chose and is as good as it gets. It has a fold-out growth chart in the front, space for a few lines about a bunch of different things (how we thought of Astrid’s name, special gifts she received, read: what her grandparents gave her, and so on), slots for basic, nice-to-have-recorded info (like great-grandparents’ names), and pages for pictures new parents are already taking anyway (baby shower, first room, birth announcement). No novels required. And the illustrations are lovely. Bonus: all the text is adoption/foster child friendly. 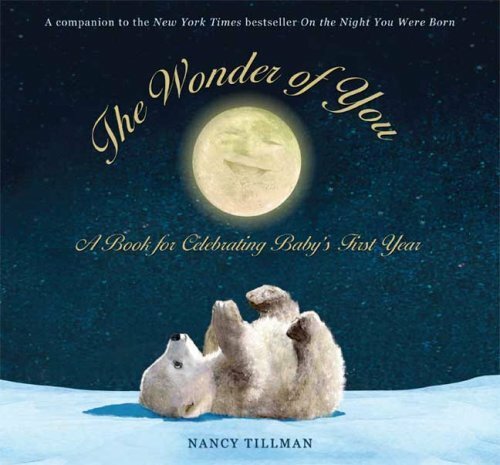 This paired with author Tillman’s beautiful story book, On the Night You Were Born make a great addition to a shower gift. Or an appropriate, not-too-expensive gift for that cousin or friend-of-a-friend whose tastes you don’t know well.